Last January, we spotlighted 11 street redesign projects where the city’s Department of Design and Construction had fallen years behind schedule. One year later, most of those projects are still not finished. The consequences of DDC’s inability to deliver projects in a reasonable amount of time are extensive. To start with the obvious, the public goes years without the benefits of projects that reduce traffic injuries, improve transit service, and enhance access to public space. The delays also undermine the public planning process — all the meetings and feedback the city received are a distant memory when construction starts. And by the time DDC breaks ground, the design may already be out of date and inconsistent with the city’s current best practices. DDC is not forthcoming about why its projects take so long. When pressed, the agency usually blames complications due to subsurface infrastructure or coordination with other city agencies. These factors matter to some degree, to be sure, but it’s hard to believe that they fully explain how a whole decade can pass between the announcement of a street construction project and its completion. We’re following up on last year’s reporting with two posts. Today we’ll survey the long-delayed DDC projects that wrapped up in 2016. Tomorrow we’ll look at the projects that still aren’t finished. 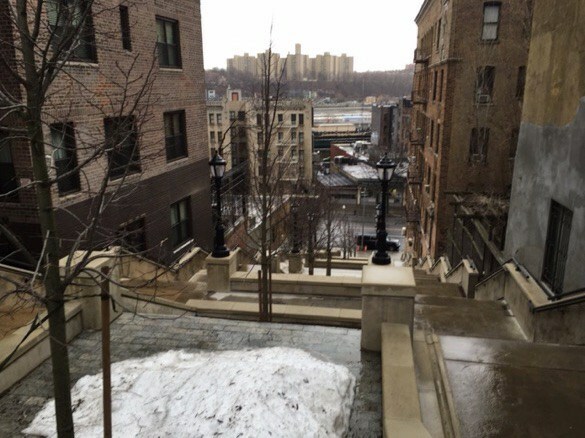 The rehabilitated 215th step-street opened in February — two years after construction began. Construction took about seven months longer than expected, but that only tells part of the story. Many more years had passed since the project was first announced in the early aughts. After neighborhood residents began advocating to fix up the stairs in the late 1990s, DDC made an announcement about rehab work in 2005 at the bottom of the steps. A similar event was held in 2008, when DDC told Streetsblog work would start the next year. By the fall of 2011, the agency had pushed that date to summer 2013. Construction didn’t get started until January of the next year. Now that the stairs are done, they look great, with concrete bike ramps, landscaping, and an inspirational Nelson Mandela quote near the summit. It just shouldn’t have taken a decade to get done. After the design was first unveiled, another three years passed before it was presented to the local community board in 2011. DDC didn’t break ground on the project until September 2013, more than two years later. Last year, DDC told Streetsblog that “delays [are] due to utility interference and additional work from our client agency,” referring to NYC DOT. We’re stretching the rules by including the East Houston Street reconstruction in this list. About 15 years after planning began for the project, which extends about 20 blocks across Manhattan from the East River, there’s one intersection left to fix. 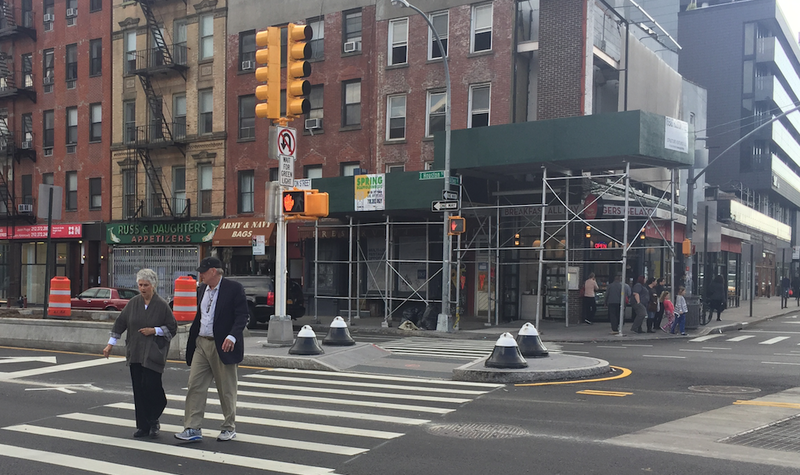 Before work at the intersection of Bowery and East Houston Street can wrap up, the city needs to install a new sewer under the street, according to a DDC spokesperson. To the east, expanded sidewalks and new medians have been finished. Construction began in 2010, and was initially scheduled to wrap up in 2013. Now DDC says work will wrap up this summer. In the 15 years since the plan was first floated, protected bike lanes became a standard treatment on NYC streets. But the city did not adapt the East Houston design during the many years the project was in the pipeline. Now the absence of protected bike lanes on Houston Street feels like a glaring omission — a missed opportunity the city will be stuck with for a while. This project wasn’t on our list last year, but it would have fit right in. 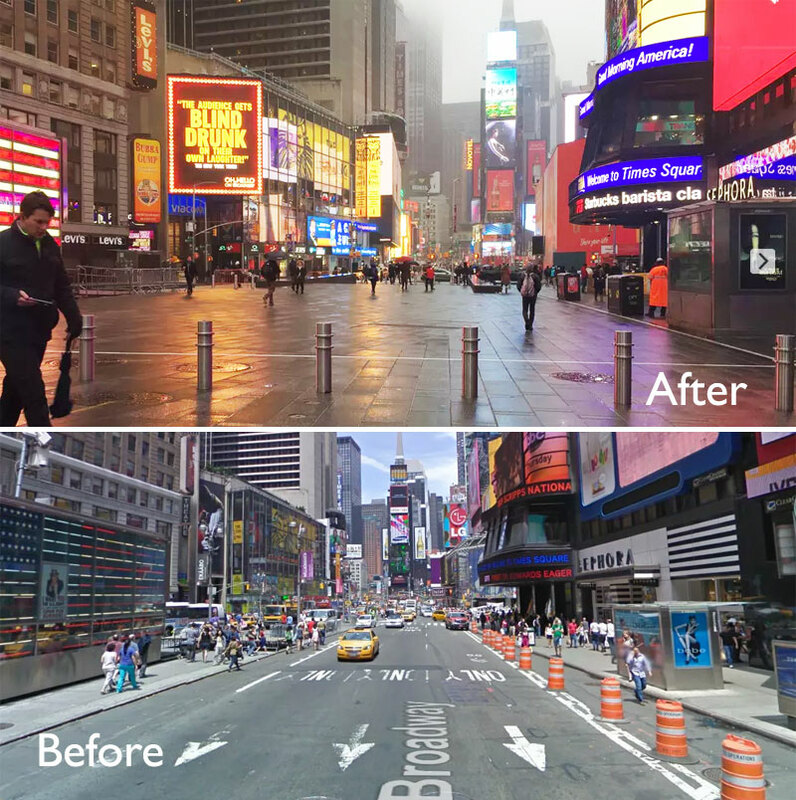 Plans to build out the 2009 paint-and-planters version of the Times Square plazas with permanent materials were finalized in 2011, and construction began the next year. At the time, DNAinfo reported that construction would finish by 2014, but it ended up running through the end of 2016. At last month’s ribbon-cutting event celebrating the plazas’ completion, DDC and DOT officials lauded their “on-time” completion before the ball dropped to ring in 2017. In reality, the project ran into several delays, which DDC attributed to complex utility work. The Times Sq stuff happened relatively quickly because of extraordinary intervention by city officials outside of DDC so that the work would be well underway before the end of 2013. DDC has an internal issues with a Commissioner who is unable to manage projects and staff. If he stopped hiring his friends in his office, and hired capable qualified staff than possible work could be done. Torres chairs the City Council's new investigative committee, and he's bristling with ideas to put it to good use. The same local business groups that publicly supported the city's plaza program often take a huge hit from the Department of Design and Construction's lengthy and unpredictable construction process.